I am really enjoying this keyboard in the short time I have had it. Getting used to the function layers has a bit of a learning curve but the thing is a dream to type on. The only issue I have is psychological. I owned a different 60% many years ago (hhkb) and my brain is apparently still used tot hat layout even though I haven't touched one in years. I keep pressing "" when I mean to press backspace and capslock when I want to press control. But the overall benefits to my touch typing are still present. With fewer keys in a compact layout I have an easy time orienting myself if I lose my place. And I enjoy the reduced range of motion and efficiency of movement even certain basic actions require combinations. The big unknown for me is how I will incorporate the programability in my daily use. But it is pretty easy to do, and I don't think it will be tough to get used to. I am not quite sure why it is listed here as 6 key rollover, since I have had no problems getting it to register well over 10 keys simultaneously without failure or ghosting. The only (minor) negative was for me the lack of a paper manual. Considering the official instruction manual is only a couple of pages, it seems like an oversight to not include one in box. I would also have preferred if the caps lock led was not a different color from the rest of the keyboard. I just bought my Pok3r back at October 28th 2017 (not even 2 months ago) from MechanicalKeyboards.com and the spacebar key is already starting to rub off. The quality control is poor. Now I have to buy another keyset as this imperfection is going to drive me nuts. Warning, you will need to buy more keycaps if you use your keyboard a lot (even when its only been less than 2 months). Great price but quality control is garbage. Brilliant Keyboard. Metal base is sturdy and gives a fantastic typing experience as it allows you to really slam down on the keys with little to no flex at the bottom out. I've only used cherry blue switches before this so I was a bit hesitant to use the clears but I love them just as much! They are signifigantly heavier than blues but not enough for any type of fatigue to set in. I purchased this for work and the clears are just as satisfying to type on as the blue but don't disturb everyone around me. I would recommend this keyboard to anyone who likes 60 percent keyboards like myself. My only gripe about the keyboard is the fact that the default location of the arrow keys seems a bit strange. BOb, that is a very helpful review. Why in the world would you have purchased a keyboard if you knew you wanted more than 60 something keys? And then cry about it to the rest of the world? I discounted this keyboard because it didn't have pbt keys. I was always an ABS fan but after the Poker the and set of PBT Leopolds I decided I was a PBT fan. The ABS keys on this board give a wonderful typing experience. It just feels different at first. I now prefer ABS again. Of all by boards the Poker 3 LED is my favorite. It's sturdy, handsome, programmable, and does everything I need. A comparable board to this would be the V60 which I really like, but the key caps are of lesser quality and the case is plastic, not metal. IT does however make it lighter, so some may prefer this. Vortex is coming out with the RGB version of this board. I have to say I have little interest in that. I prefer plain old white light, but this is a matter of preference. If you love the Poker and you think you can deal with the caps, than get this board. Overall good. Green keys feel great. But it does have some coil whine when the backlight is on.Trying to let it run to see if that eliminates it, but no luck yet. Would be a 5 without the coil whine. I have had this keyboard for a few days now, and am absolutely in love! The clear mx switches are by far my favorite, and have a unique heavy but smooth feel and a very pleasing 'thock' sound that I did not anticipate. I decided to give clears a go because i found mx browns to be a bit too mushy while not providing enough feedback, and found my mx blues just too loud for an office environment. My previous 60% keyboard was a ducky mini, and compared to that, the pok3r is much more intuitive and a all around better experience. The main reason for this is the positioning of the arrow keys. On the ducky mini, arrow keys were accessed via 'olk;' so you have to move your hand to a special position just to use them. On the Pok3r, arrow keys are set to 'ijkl', which means I don't have to move my hand off my home row to use them. It is fantastic. I highly recommend flipping the 3rd dipswitch on the back of the keyboard to convert your capslock key into a function key to make use of the arrows even easier. As far as backligting goes, the white led's give off a very nice looking glow, especially combined with the white backplate. They can get super bright if that's your thing, and can be reasonably dim too. The ABS keycaps are just what you would expect. They're kind of light, and smooth to the touch. The font is tastefully done. I got this keyboard to put in a custom case with some SA keycaps, so these stock caps were not a factor in my purchasing. All in all, fantastic board. 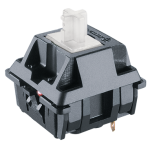 Cherry Mx Clear switches are by far the best in my opinion, and the layout and build quality of this board is second to none. I was on the fence between buying the KBParadise V60 and this keyboard. What sold me on this keyboard are the clear advantages - the aluminum case, programming, and the solid construction. The Cherry MX Clears are a dream to type and game on. 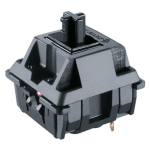 If you're questioning the pros / cons of these switches, trust me - you will not regret these one bit. My previous switches were Cherry MX Browns, and these feel much like them, but improved. It's hard to describe, but trust me - they are fantastic. One criticism is that this keyboard has laser etched ABS keys. 90% of you will probably swap out the keycaps for something fun anyway, so if you're new to the Pok3r / 60% layout, you'll quickly learn the function layer and have no need for the stock keycaps with front printing anymore. Another criticism about this keyboard is the lack of volume controls. They're there. A firmware update added the controls with a simple function key combo. The firmware update was already on the keyboard I received. You have no reason not to buy this keyboard for lack of volume controls. The only thing you'll be missing is the front printing on the keycaps. See my comment above about the keycaps. This keyboard is solid. Other 60% keyboards have a plastic shell. This comes STOCK with an aluminum case. You will find that every key press feels more solid. I have had zero issues with keys bottoming out or making pings on the case. I transport this between home and work in a soft case, and don't worry about it being damaged. The only potential downside for some users is the one color backlighting. At the time of this review, an RGB backlighting Pok3r is coming. If you need those colors to complete your life, by all means wait and buy that model. If white is your thing, or don't need backlighting at all (you can turn it off), then this is the keyboard for you. In summary, the amount of features in this keyboard at this price point is well worth the price. If you're comparing this to other 60% keyboards, I think you will be very happy with this purchase. Amazing keyboard. Incredible tying experience.